Five questions explored consumer mindset. Six retailers discuss the implications of the answers. 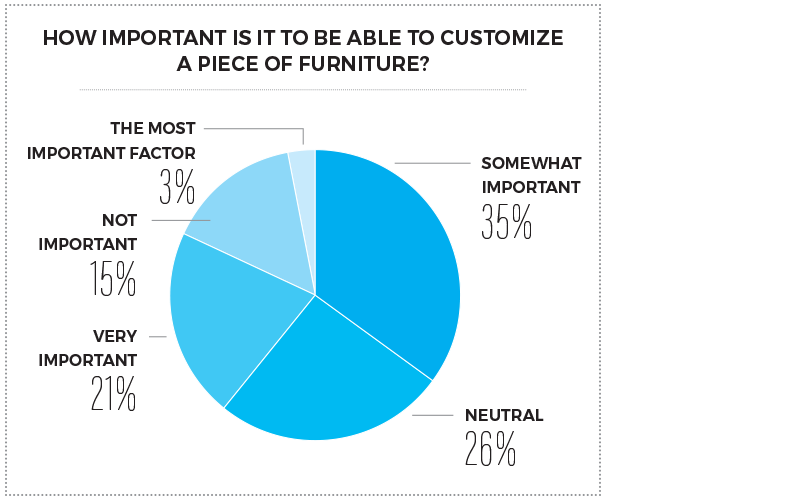 To get a better read on the buying public’s mindset heading into the new year, the Furniture, Lighting & Decor research team surveyed consumers across the country about what matters to them in the furniture buying process. 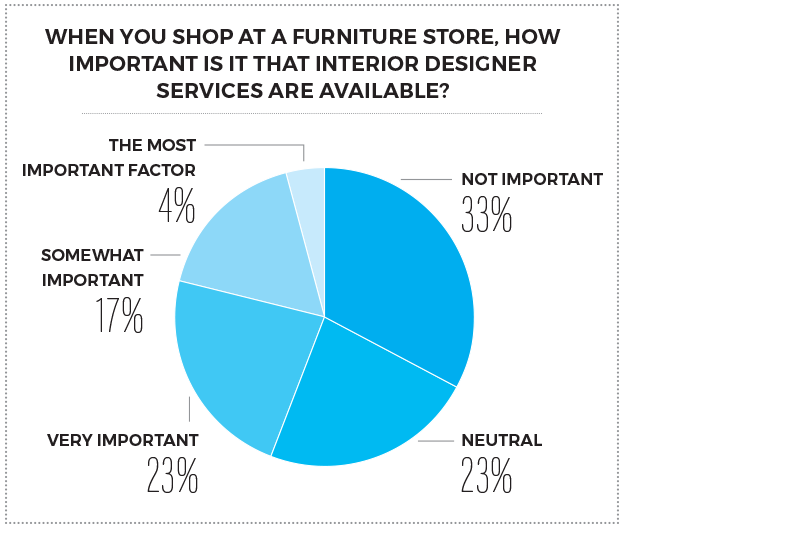 The questions we asked ranged from where they would shop to whether they considered things like interior design services and customization important. The answers were, in a word, eye-opening. 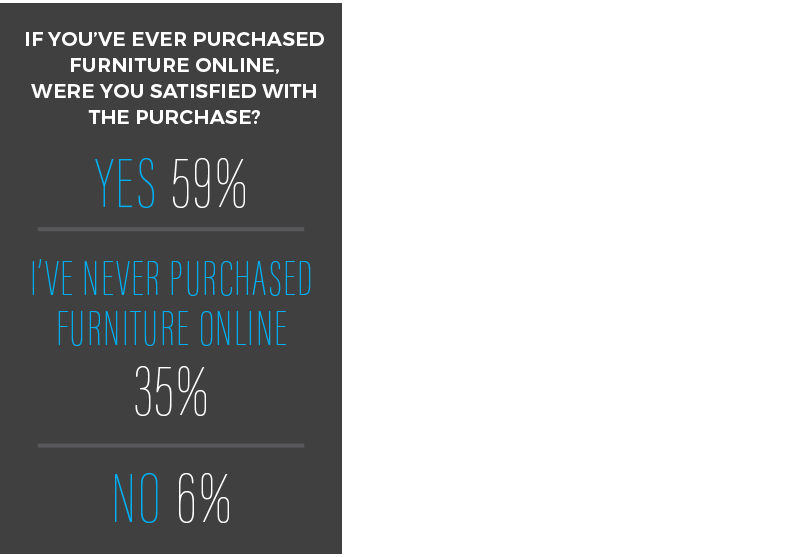 We learned that local independent furniture retailers, long the backbone of the furniture industry, are no longer the first place that shoppers think of when considering a purchase. Certainly, while we expected to see evidence of more disruptive online activity — somebody is driving those Wayfair and Amazon figures after all — we were taken by surprise by how quickly one national, brick-and-mortar retail brand has achieved top-of-mind awareness. 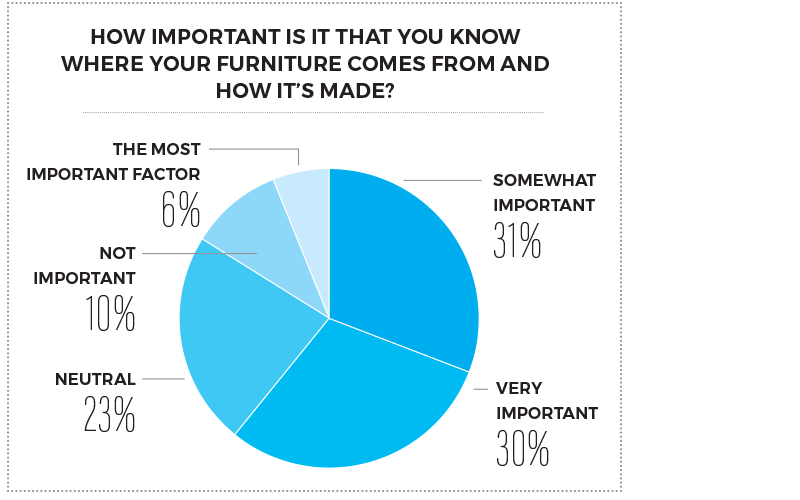 And, while consumers seem more interested than ever before in where the furniture they buy comes from and how it is made, fewer appear to be concerned about the pitfalls possible when purchasing products without the assistance of an interior designer. Statistically sound and diverse though our sample was, since knowledge is power, we also sought boots-on-the-ground insights from independent merchants across the country. Our aim was to see whether the consumer responses mirrored what’s really happening on retail floors. 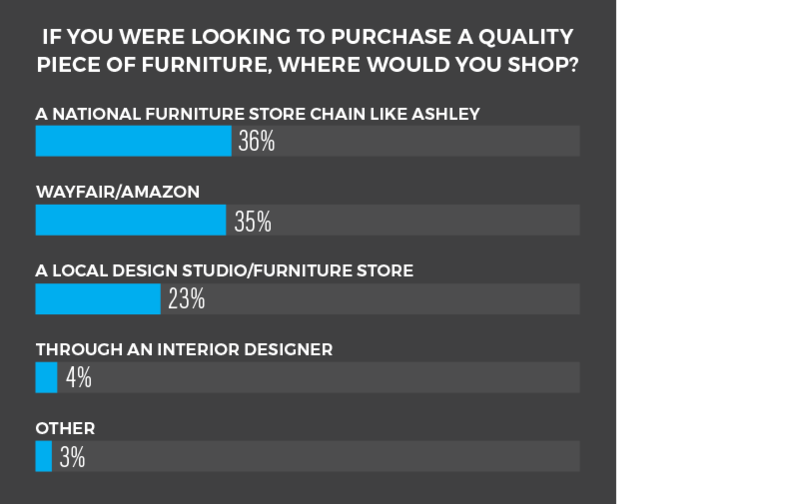 Given that the Ashley HomeStore brand opened its 900th store in New Zealand last month, maybe the number-one answer—A national furniture store chain like Ashley (36 percent) — should not catch anyone napping. Launched in Anchorage, AK in 1997, the chain has grown to become the number-one store in North America in little more than two decades, with more than 400 stores added in just the past four years — making it the only truly national chain with a fast-growing international presence as well. Though many Ashley HomeStores are independently owned and operated, all of the furniture sold is manufactured by Ashley Furniture Industries. “One thing our industry has done a very poor job of overall is telling customers ‘I will make your life better if you include my products in your home,’” says Lael Thompson, Chief Operating Officer at Sonshine Furniture Today, which owns and operates the Broyhill Home Collections store in Aurora, CO. “In my opinion, this is a direct result of marketing. The two answers with the highest responses are the companies telling the customer, ‘I will make you happy.’ Look at the Wayfair ads with happy people dancing around. Wayfair is saying, ‘Don’t you want to be like them?’” Ashley too “has been pounding national ads,” adds Preston Matthews, owner of Brown Squirrel, an independent furniture store in Knoxville, TN. That’s an issue for independent retailers who relied on newspaper and television advertising and even radio to tell their stories for decades. Media fragmentation resulting in hundreds of television and satellite radio channels and the demise of local newspaper ads has made it extremely difficult for independent stores to get their messages across. 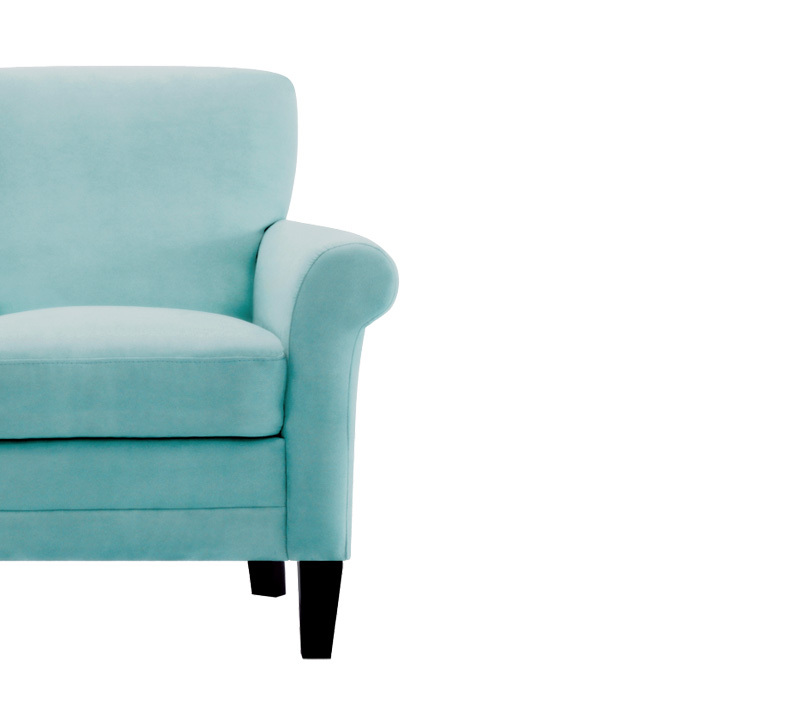 “Trying to get out there and advertise is the hardest thing now,” agrees Dru Jeppe, Chief Inspiration Officer at Reeds Furniture in Agoura Hills, CA, where the goal is to “inspire beautiful lives” by creating warm, happy and comfortable furniture shopping experiences. “There’s no real CRM, no real way to make deep customer connections aggregating all the data points and you really don’t know who your customer is,” the executive reports. “Wayfair and Amazon and these other people have all the data points connected and they know exactly how to touch people, even if they are selling them crap. They may be doing consumers a disservice, but the Walmart philosophy is completely entrenched in our industry and others. “Anytime you use the term interior design/interior designer when you’re talking to the masses, because their perception is that interior design services equal a higher price, so this may affect the answer to this question,” relates Matthews at Brown Squirrel, which dominates the Knoxville market with a reported 65 percent of share and has been steadily trading up its lifestyle presentation (the store has undergone a major facelift thanks to retail strategist Connie Post) adding brands like Bernhardt and Smith Bros.